The incessant evolution of society, in parallel with technological development has inevitably influenced all aspects of everyday life of each of us, it continues to do so incessantly, looking to the future. This evolution affects the physical space in which we live, working space, learning and consumption. The physical space is in fact the element that more than any other affects, positively or negatively, our results. In order to make the best, individual spaces, the classic offices divided into compartments, study classrooms leave room for hybrid, shared and flexible environments. The timetables become less rigid, the hierarchies become thinner, the spaces change in favor of informal, almost domestic environments. There are islands of entertainment between desks and PCs, which make the day less stressful for students, workers and customers. This evolution leads to indisputable, objective advantages, and it is an inevitable and necessary process, but a more in-depth review is needed, balancing positive and problematic aspects. In this context, a concrete risk is that of canceling the idea of ​​a domestic environment, which has always been primary in the existence of every individual. 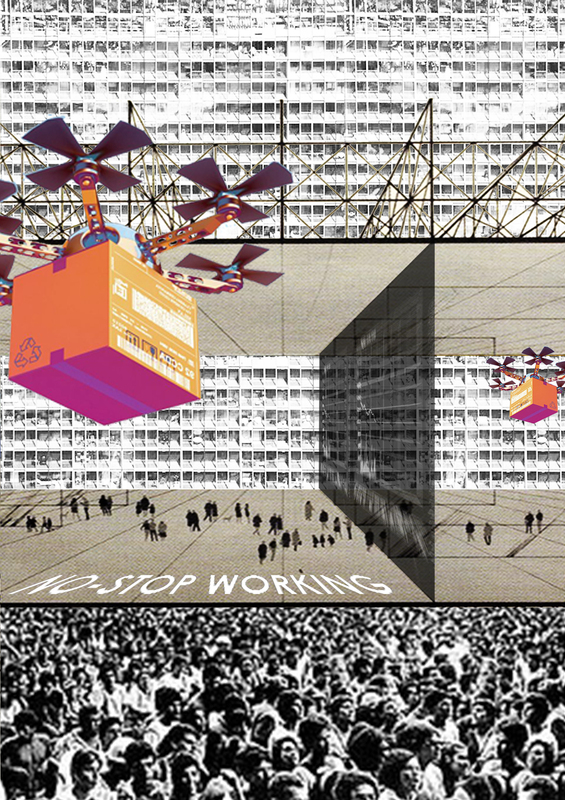 My proposal, No-stop working city, arises from the perspective of a critical rather than pessimistic revision. This dystopian reality, on the avant-garde line of the mid-20th century, offers a hybrid space, geographical location, size and indefinite destination, habitat of a population alienated from 24/24 h availability of products, information and spaces to carry out their own activities, which ends up canceling their individuality, reducing each to their role as workers, students or consumers.